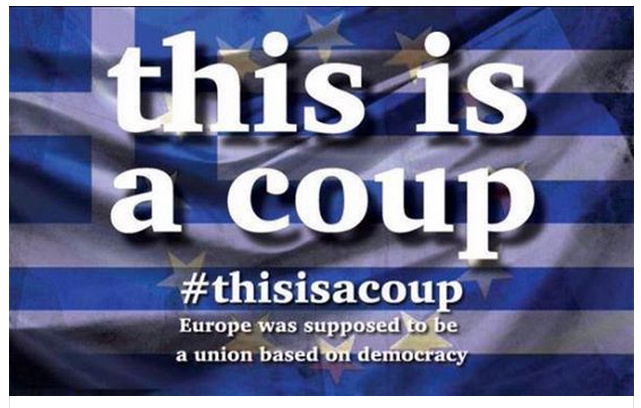 #ThisIsACoup hashtag refers to Greece’s indebtedness to European banks. On Democracy Now today, Amy Goodman reported on an economic panel assembled by Vermont Senator and Democratic Presidential Candidate Bernie Sanders. “Five years of cruel and counterproductive austerity policies… have left the people of Greece with a full-blown humanitarian crisis. In my view, there is no more obvious example of the failure of austerity policies than what is going on in Greece,” Sanders continued. Watch the Democracy Now clip below. It’s time to break this web of debt that Wall Street, the European Banks, the International Monetary Fund, the World Bank, and the other players in the international banking cartel have on us. If you want to learn more, I highly recommend this book. It is eye-opening! Remember… Austerity is a lie. There is plenty of money. The problem is that it is invested in Wall Street and not Main Street.